This is a step by step tutorial of how to sign up for ClickFunnels (for beginners)! Keep in mind, this is just one way you can sign up for ClickFunnels. Obviously I went through my YouTube video which means it would be under my affiliate link. If you went about it exactly as I have showed you in this tutorial, you would get my FREE Funnel! This is cool because I have already set everything up for you. But if you choose to take a different route and sign up a different way that is totally fine also. ClickFunnels will try to make you sign up for the Full Suite ($297 per month) so you’re going to want to change that. Once you are advanced with ClickFunnels, then I would recommend upgrading to the Full Suite down the road. The basic package ($97 per month) is literally all YOU need as a beginner. I’m obviously not a beginner yet I still only use the basic package because it gets the job done for me. One thing to remember is that you have those first 14 days completely FREE! So this gives you two full weeks to explore and get yourself accustomed to ClickFunnels itself. It’s just like anything really. Starting off, things might seem a bit fuzzy but the more you use ClickFunnels the more you get good at it! Go sign up and start playing around with it! You won’t regret it! Here is the link to my FREE Course! 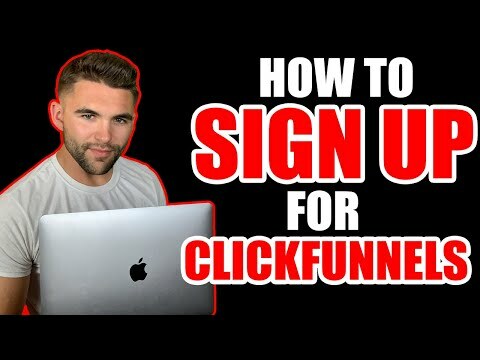 Thank you so much for watching this video on exactly how to sign up for ClickFunnels. Hopefully you’re a pro now! Let me know in the comment section below if you have any more questions about the sign up process. Affiliate marketing is all about accepting failure and pushing past it until you have success! Don’t forget to Subscribe!